How do we make a future that works for all of us? How do we support a people’s agenda—a platform for us which recognizes and advances the needs and desires of all people to thrive in a healthy and just world? In January and early February 2018, CURE’s non-partisan Rural Democracy is presenting The Art of Caucusing training throughout west central and southwestern Minnesota. This training will teach you what caucuses are, how to participate, and how to write, present, and advance resolutions. The democratic process does not stop after the caucus; you will also learn about what happens at your County, Senate District Convention, Congressional District, and State Conventions, and how you can be a delegate who further advances a people’s agenda. To register CLICK HERE or contact CURE’s Rural Democracy project at peg@cureriver.org or 320-269-2984. Event check-in starts at 6:00 pm and the training starts at 6:30 pm. 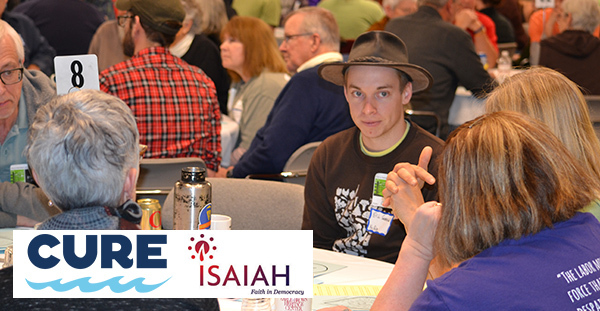 This event is being co-hosted by ISAIAH.